Virun® NutraBIOsciences® Showcases Hot Young Musical Talent, Hosts Informative Panel Discussions and Presents its’ New Product Offering to the Masses at Inaugural Music and Food Science Event. 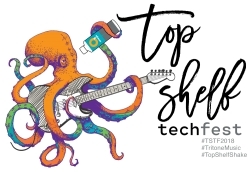 Pomona, CA, March 01, 2018 --(PR.com)-- Virun NutraBIOsciences is ready to rock the house on April 22, 2018 as it will host the first annual Top Shelf Tech Fest 2018 in Pomona, a music festival and food science event focused upon showcasing the natural interactions between innovative thinking, future creativity and the arts. The seminal food-science and music festival begins on Sunday, April 22 at 10 a.m. with two 45-minute panel discussions; "Biotechnology in the Food, Beverage, and Supplement Space," followed by "Millennials - Not Lazy, Industry Just Doesn't Give Them a Chance." The Bands kick off at noon, with several hot young groups from the local music scene set to rock the stage. First up is Tritone Music, known for its 8-year-old Prodigy Rock Stars, who have played such infamous local venues as The World Famous SlideBar Rock and Roll Kitchen in Fullerton, and the Doll House of Fullerton. Local rock trio Porcelain Hill will follow, bringing their hard-hitting brand of the blues to the stage. Last but not least, Top Shelf Shake, the Southern California Reggae-Rock band lending its name to the festival, will headline. Food and drink will be served, and a large crowd is anticipated. Mosh pit optional. The event will also serve as the launch party for Virun's O3omega(TM) O3Smoothies, an algal DHA Omega 3 MCT dietary supplement multi-serving smoothie. O3Smoothies have a whopping 3000mg MCT, 400mg omega DHA, and 2g protein per one-tablespoon serving and 30 servings per bottle. The smoothies are free of soy, fish, gluten and sugar, and the products are sustain-ably sourced from coconuts and from vegan algal DHA (no fish). "The best part," states Peter Hoosier, Virun's Operations Manager, "is the flavors are completely unheard of. Fruit flavors have nothing to do with fatty acids, so it;s no wonder people are tired of flavors like lemon or fruit punch. We're telling people it's okay to have a supplement with real flavor, like a Root Beer Float, or Breakfast with Bacon, which tastes like pancakes, melted butter, maple syrup and crispy smoky bacon." The smoothies are meant to be a mutli-layered experience, similar to that envisioned in Willy Wonka's chocolate factory. O3Smoothies can be found at www.O3SMOOTHIES.com and on Amazon. Founded in 2003, Virun NutraBIOsciences was formed to create nutritious, great tasting and novel formulations for the food, beverage, supplement and pharmaceutical industries. Located in Pomona, California, Virun is a fully integrated research, production and manufacturing facility which quickly conceptualizes ideas to create innovative custom bulk blends and finished products for contract manufacturing. Virun is the only biotechnology company that owns over 50 patents worldwide and develops technology around biotechnology practices. Its' technologies include Esolv, a clean-label claim emulsifier; OmegaH2O, which incorporates omega-3 EPA DHA into clear, shelf stable clean-label claim beverages without a fishy taste; Probiferrin, a technology that increases the bio-availability and shelf-life of probiotics in powders and beverages; and other innovative solutions and brands, including its' own line of algal-omega DHA MCT smoothies. Manufacturers interested in learning more can contact Virun at www.virun.com. Top Shelf Shake is a 3-piece reggae-rock band from Chino, California with an explosive sound that combines reggae, rock, ska, and punk into a distinctly different style that they call their own. With thought provoking lyrics and catchy melodies, their songs are a fresh yet familiar take on the quintessential "Southern California sound." Since their inception in the Spring of 2014, they've set out to create music that encourages independent, positive thinking and a healthy ability to question authority, or as they put it, pit "the Power of Love against the powers that be."